This training goes hand in hand with Mary's Attitude Alignment eBook. You get 2 hours of Mary Live in this Power Packed Immediate Life Altering Performance Seriously. This presentation covers more than you knew there was to know in regard to the vibrational power of the label. There is nothing like the power of the spoken word to totally affect an outcome. Mary provides a culmination of over thirty-five years of insight, wisdom and the development of a simple, and yet profoundly powerful system that will RE-LABEL all that has gone before. In learning how to become a TurnAround Specialist, the audience will easily transform even the most difficult situations and challenging personality types in an instant. 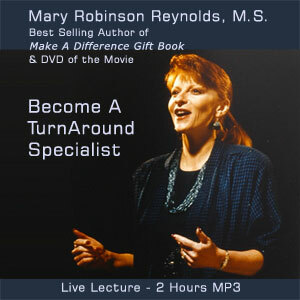 Listen to Audience Reviews of this Program: what participants said about how 2 hours with Mary changed their lives forever. This presentation covers more than you knew there was to know in regard to the vibrational power of the label. There is nothing like the power of the spoken word to totally affect an outcome. PLUS, this program comes with it's own Connecting Your Puzzle Pieces Presentation Workbook so you can listen and follow along. This is a complete and powerful training. You can also use this in training with your own company's personnel. Mary once conducted a seminar where a woman shared that she was told by her high school counselor, You're just not very smart! This woman stresses at work each and every time she is asked to do something that requires a level of intelligence that she, to this day, is not certain that she possesses. It was all a mistake. This woman is not only intelligent, but capable. Why? Because she's worked doubly hard, stressed to the max, so that she would be able to cover up this horrific, terrifying aspect that she now believes is the only truth about her. And here's the bad news. Even with as much as she tries to cover this up, she has an attitude about herself, and so she sends out this I AM JUST NOT VERY SMART vibe, and what does she get back in her interactions? People pick up on this vibe, and many will treat her like she's less than, without really meaning to. It's just there. Nobody means for this to happen, but it's in every interaction we are having to some degree. What we have been told about ourselves sticks deep within in us, and then we spend the rest of our lives trying to either 1) prove it wrong or 2) try to cover it up so we won't be found out. This adds tremendous stress that churns in us mentally and emotionally a bazillion times over. Mary has experienced, through her connections with her audience, that people in our society have very little, if any, idea how impactful their words, messages and interpretations are on each other. No one ever told us that we could simply examine whatever truth there was about what was said, and as adults, decide not only "our" personal truth, but decide upon that which we can establish 100% RESOLVE. This program goes to levels beyond a "Sensitivity Training" course! It is a training about self empowerment and the truly profound effects it will have on altering your world and the lives of those you touch. What the energy of personal power is, and how to get control of it without causing harm to others. Re-LABELING others to yield new, instant results and experiences. Mary's 3 best One-Liners for standing in your power and winning back credibility. You can literally cause harm with your attitude. Don't feel guilty � change it! You can alter a situation dramatically by sending Love Vibes, even when you may feel repulsion, anger or hate. How to pull your energy in by thinking and deliberately deciding to stop being attitudinally offensive or defensive. Why giving away what you want works "like a charm" in bringing peace and prosperity. How your children "mirror" you and family synergy, and that it's not about a battle of wills or power plays. How to eliminate that most devastating handicap -- self doubt, through re-labeling. How to free yourself from worry, stress and resentment. How to climb above problems to visualize solutions and then attain them. Simple affirmative language that you can apply to every tough situation, person or event, to reinforce your new-found personal power. Inner attitudes and images have within them an energy component. To leave out of the equation the fact that thoughts have energy and that energy is set in motion by an attitude, instantaneously affecting the people and the relationships in your world, is to totally short-circuit your efforts. With this knowledge, we can transpose and transform our thinking, and therefore our lives, our world, and our unhappy experiences. We can do it through managing our thought-energy, when we go about it deliberately and with great intention, to have more of what we want and less of what we don't want in our dealings with people. So, be sure to look for these emails.